Tudor style homes are known for having a traditional, stately air, perfect for displaying art and antiques, but not exactly the ideal environment for a young family. 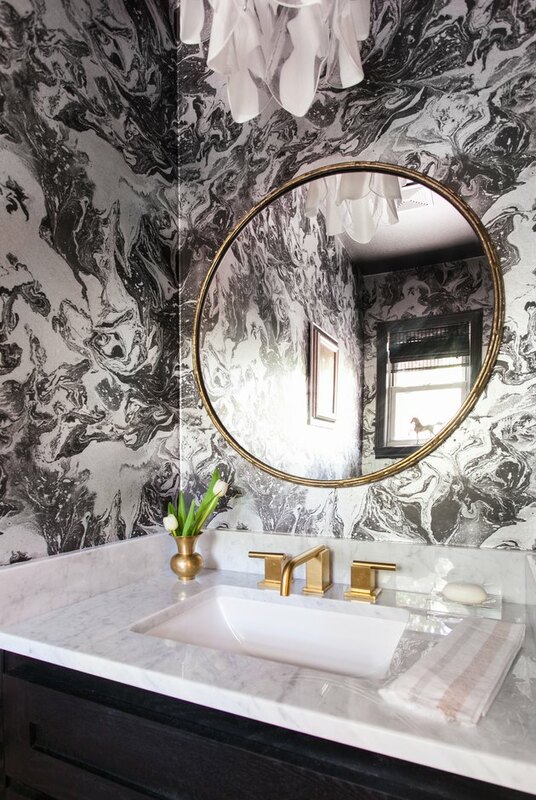 But designer Erin Williamson knew that she could help a Tudor house in South Austin loosen up a bit. The dated space was dark and decorated in a dirty, khaki green from top to bottom. Her clients gave her a strict edict: "No bland, beige interiors." 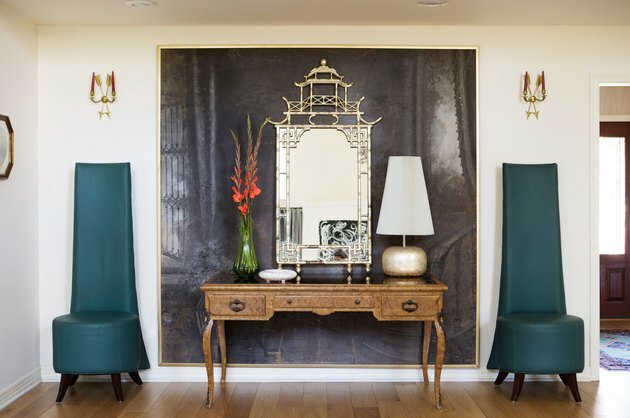 Williamson decided that every room needed an element of surprise, whether it was a bold wall color or an interesting vintage piece. Blues and greens dominate the color palette, with creams and blacks added to keep the interiors grounded. Williamson used Benjamin Moore's Cappuccino Froth as a neutral backdrop in the living room and found the chairs and mirror at the Round Top Antiques Fair and the vintage desk on Craigslist. "A lot of vintage pieces were incorporated to give a sense of collected history so that nothing stands out as an unnecessary flourish," she said. A vintage Gaetano Sciolari chandelier illuminates the dining room, which was painted with Farrow & Ball's Arsenic. 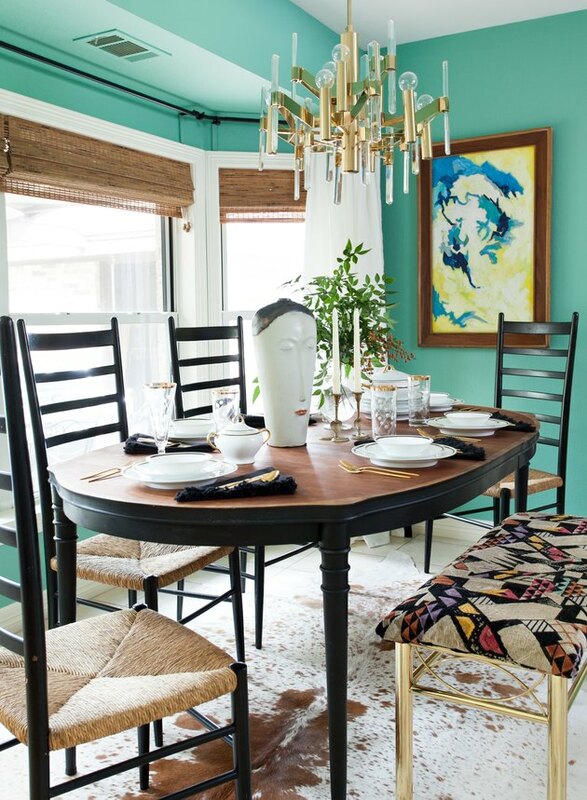 The vintage table and chairs are paired with a cowhide rug and a bench upholstered in a Clarence House fabric. 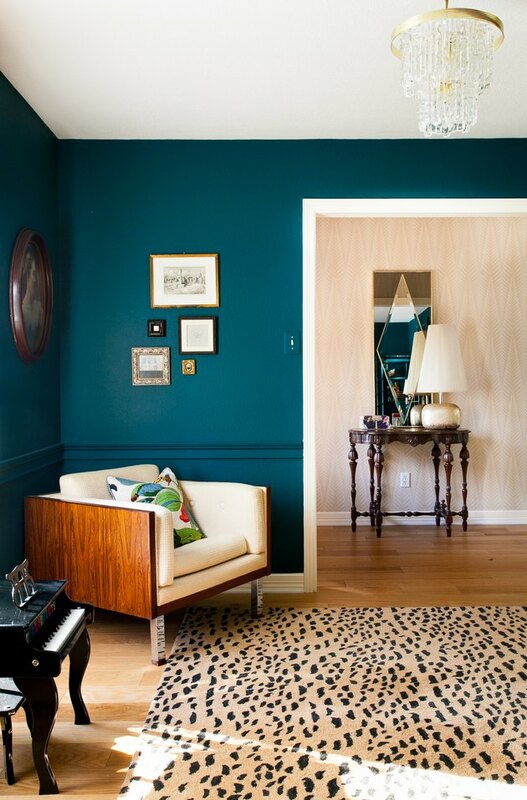 The teal bookcases and walls — painted in Benjamin Moore's Dark Harbor — set a cozy tone in the sitting room. The vintage Danish rosewood sofa is topped with pillows by Four Hands. 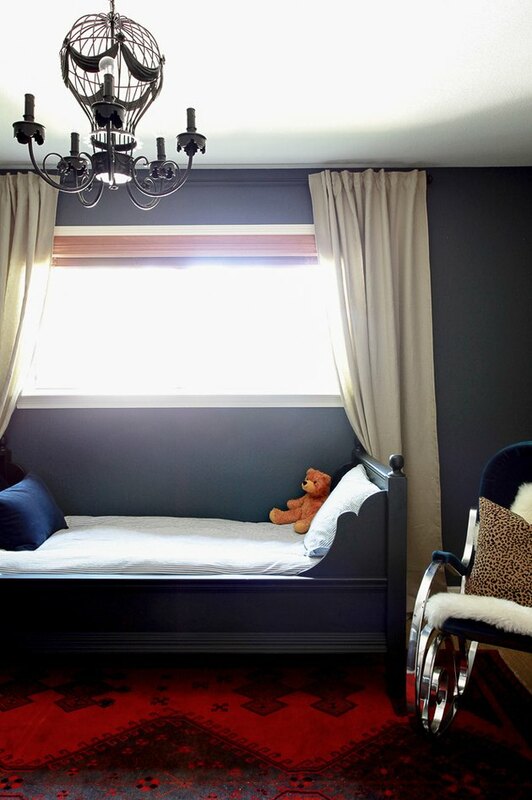 "Dark hues are balanced by creamy neutrals throughout the home. 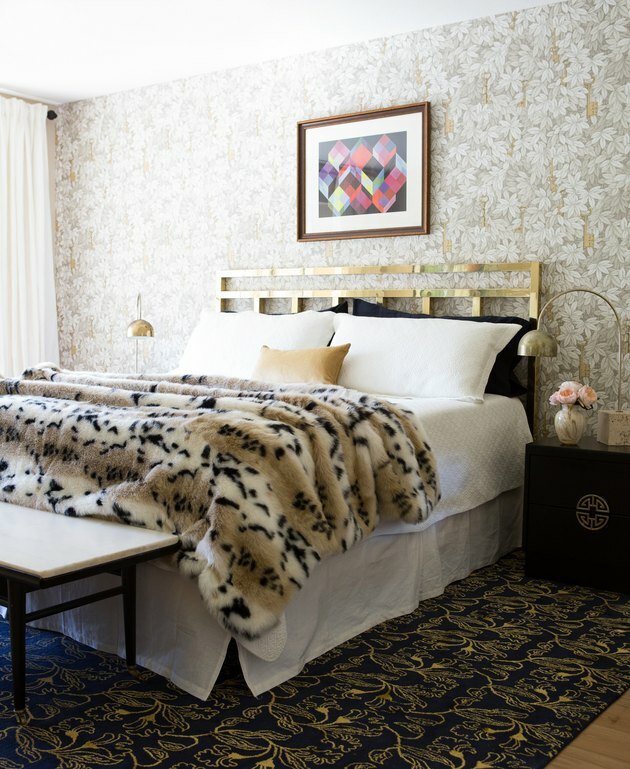 Although the colors and patterns are bold, a cohesive color palette keeps things from feeling chaotic," she said. Beyond the sitting room is a wall covered in Neisha Crosland's Zebra. 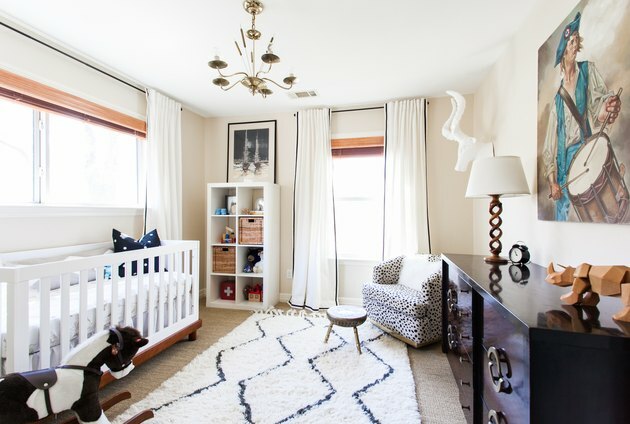 The older child's room is painted in Benjamin Moore's Deep Secret, which complements the Pottery Barn Kids bed and the vintage rocking chair.